This book explores how creativity can be represented using computational approaches. Our aim is to construct computer models that exhibit creativity in an artistic context, that is, that are capable of generating or evaluating an artwork (visual or linguistic), an interesting new idea, a subjective opinion. It examines creativity in a number of different perspectives: from its origins in nature, which is essentially blind, to humans and machines, and from generating creative ideas to evaluating and learning their novelty and usefulness. We will use a hands-on approach with case studies and examples in the Python programming language. 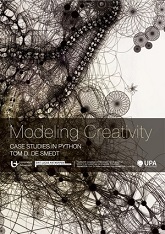 The topic of this book is to model creativity using computational approaches in Python programming language. The aim is to construct computer models that exhibit creativity in an artistic context, that is, that are capable of generating or evaluating an artwork (visual or linguistic), an interesting new idea, a subjective opinion. Tom De Smedt is a senior researcher at the Computational Linguistics Research Group, co-founder of the Experimental Media Research Group, and co-founder of the language technology company Textgain. He has a doctoral degree in Arts, a master's degree in new media art and a bachelor's degree in software engineering. Artificial Intelligence (AI), Logic Programming, Machine Learning, etc.